SNV, a not- for- profit development organisation from the Netherlands, recently chose to visit the school gardens in Nwoya, as part of a 2 day learning visit for 13 organisations from Nebbi and Aura Districts. The aim was to showcase the great work that African Revival has been doing as a wonderful example to others. The choice to visit African Revival schools was made by SNV about 2 months ago, where it became clear that African Revival was performing better than any of the other organisations in the programme. Congratulations to Francis Nyeko, Project Coordinator and to Babra Akello and Denis Odong, Field Extension workers for their great work and dedication in developing our work in Uganda. 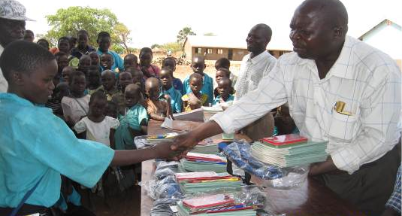 African Revival recently organised a Certificate Award Day for the pupils and teachers at Juba Road. This project is aimed at increasing the motivation for the pupils and teachers by awarding small prizes such as school bags, books, pens maths sets and mattresses for the best performing pupils, the most improved pupil, the best pupil in sports and to honour hard work, academic performances and skills in athletics etc. The day is always a great success and it brings the parents closer to the school as they are invited to join the celebration of the achievements of the pupils. All the pupils from the school are joining in the celebration and the awarded pupils are called forward in front of the entire school where they receive their small rewards and their certificate of achievement. It is fantastic to see the pride and joy of the parents when they realise that their child has excelled. In true Ugandan style many of the mothers joined their child in front of the school shouting praises and demonstrating their pride and happiness with their child’s achievement. The certificate reward day is one of the ways through which African Revival is trying to enhance the parental involvement in the schools and the interest in the individual child’s development and education. Too often the parents are disengaged from their child’s education and the children are not always receiving the needed support from their homes. The certificate reward day brings everyone together and this greatly helps to bridge the gap between the school and the parents.